Prepare popcorn ball mix, replacing red food coloring with green. (Here's the recipe link: brain popcorn balls recipe ) You can definitely make the trees a day ahead and store in an airtight container. With oiled hands, form the mixture into 10 small balls. Insert a popcorn ball in each. Set aside. Sprinkle the cookie crumbs on top of the frosted cake. Plant the popcorn ball trees. Whether you’re commemorating Earth Day or just celebrating spring greenery, take the time to plant some trees…in your cake! 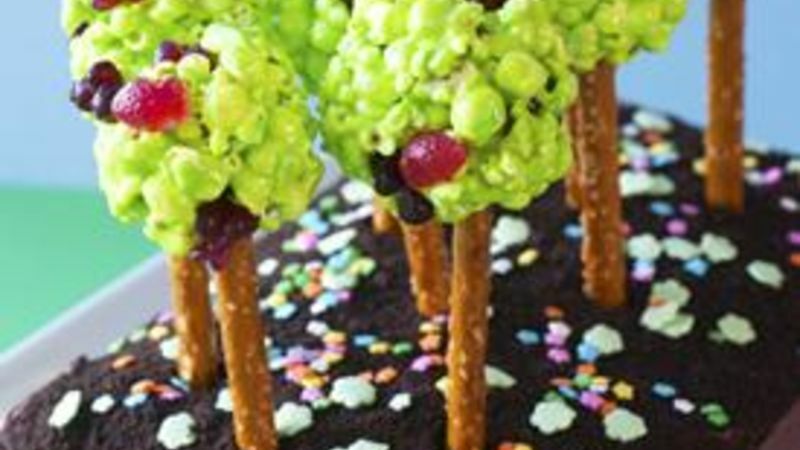 This delicious Earth Day Cake with a fruit tree orchard is made of popcorn balls studded with fruit snacks on pretzel rod trunks! It’s a fun and easy way to dress up a cake. Any layer cake will do—you definitely want layers though, rather than just a sheet cake. The frosting provides a little extra stability for the pretzel rods. I used a three layer sheet cake—chocolate top and bottom layers with a middle layer of spice cake. All frosted heavily with chocolate, naturally! I made the popcorn ball trees a day ahead. Your favorite popcorn ball recipe will work, too—I love my marshmallow-based recipe for its simplicity and deliciousness, the marshmallows (of course), and because the popcorn balls stay so shiny. To prepare, just melt marshmallows and butter over low heat, and then add food coloring. I used a base of neon green, with a few drops of regular green added just before I added the popcorn. Important safety tip: popcorn balls are a sticky job, but someone’s got to do it. Make sure all of your supplies (wax paper, oil, lots of paper towels) are at hand, and work with oiled hands. Once you’ve formed the popcorn balls, insert a pretzel rod and set aside. Violà, your forest is ready for planting! To finish the cake, just frost the top and sprinkle with cookie crumbs (I sprinkled mine before I frosted the sides of my cake as I am a somewhat messy crumb sprinkler). Then plant your “trees” and add a few flower shaped sprinkles. Hope you enjoy, and have a lovely, happy, green Earth Day! For more Earth Day party fun, get crafty with these Earth Day Notebooks (check out the delicious food ideas in this article, too! ).